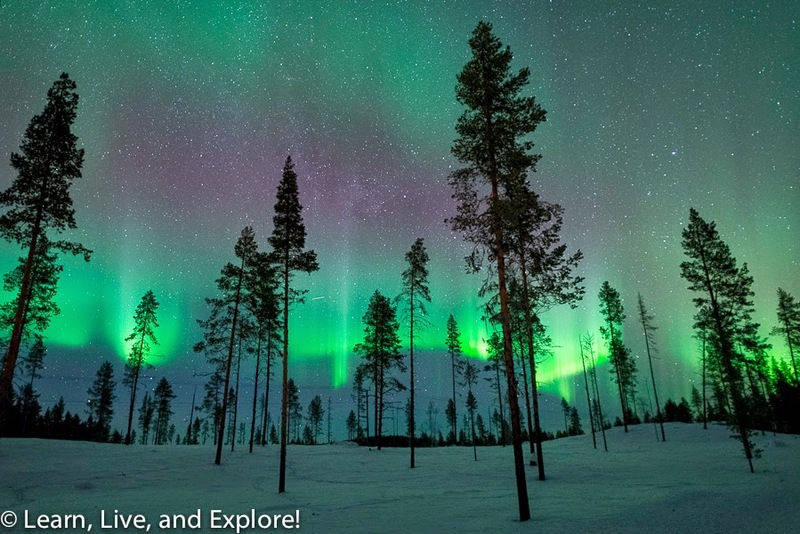 Seeing the Aurora Borealis for the First Time ~ Learn, Live, and Explore! While some people may say they have to have perfect weather in order to have a perfect trip, I disagree. Sometimes it takes the bad weather to make you really appreciate the moments of good weather. 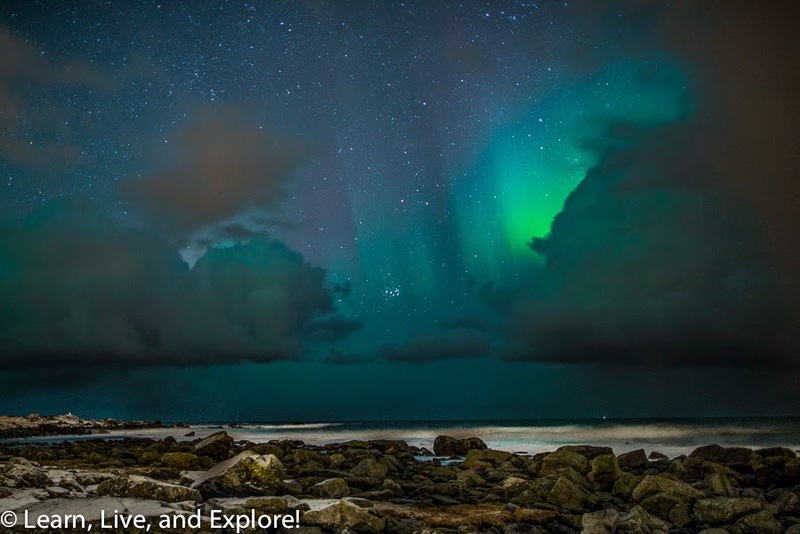 In the case of my recent trip to Norway, specifically to see the Aurora Borealis (or Northern Lights) for the first time, we didn't have one solidly clear night until the night before we were leaving to go home. 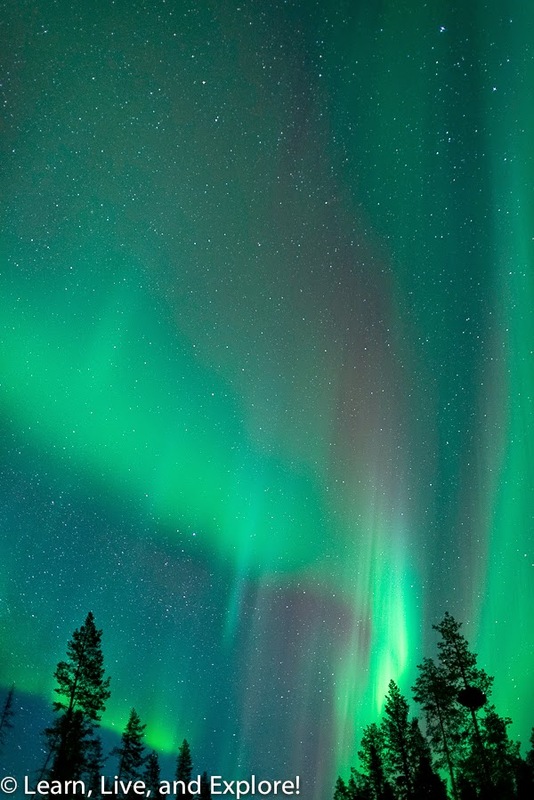 And even in that instance, we had to drive to Sweden to find clear skies. The wait, the many miles logged, and the many hours spent in that van chasing the aurora was worth it for that last light show, though! 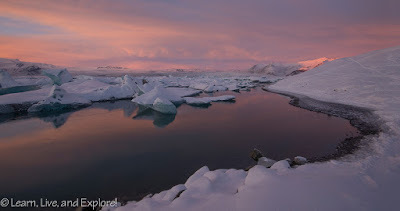 First, before I get ahead of myself, I want to share a helpful photography gear list, good websites to know, and then some of the "teaser" photos of the nights when the aurora was trying to poke through the cloud cover earlier in the week. Cold weather gear for yourself! Teaser Photos: For six nights, we were dealing with cloudy or mostly cloudy skies. 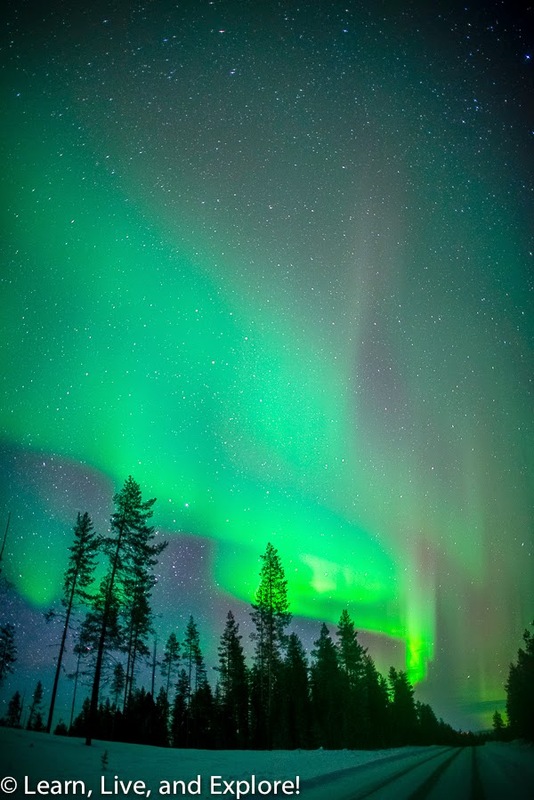 The second night, we could see the aurora illuminating the clouds from behind and trying to peek through clearings, but it was a sheet of green with not a lot of detail. We practiced with our camera settings outside our lodging, then headed to a beach with mountains in the background to try for some better compositions. The clouds were just not cooperating to give us the perfect shots, though. 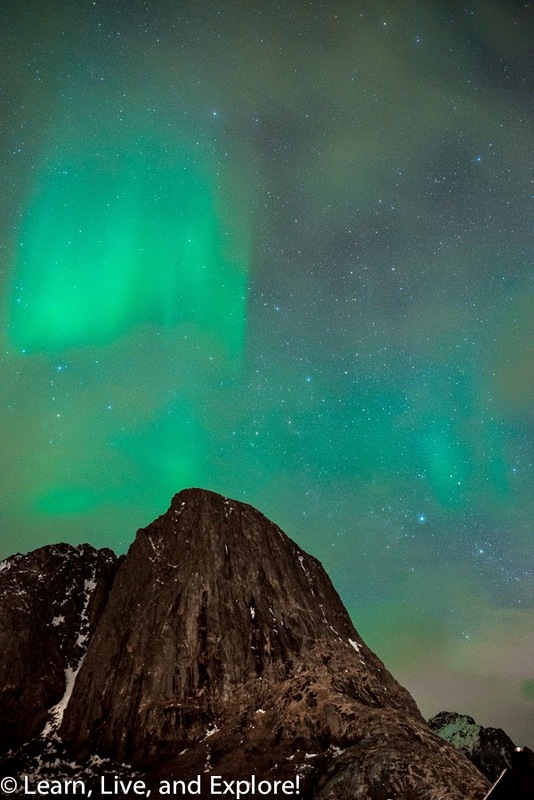 I was doing a lot of late night reading and photo editing while in the Lofoten Islands, and one night before turning the light out after 1am, I checked Instagram and saw one of the photographers I follow had posted a great photo of the aurora claiming to have been shot that night over in Finland. Skeptical because of my weather observations earlier, I peeked out my curtains and saw stars! Could it be the clear skies we needed? I went outside in my pajamas with my camera and took some test shots of what looked like the aurora, and it was there! I woke up a few people, and we got some shots before the clouds returned. I think I stayed up until 4am that night with the false hope that the clouds would leave again and we would finally get our light show, but it never happened. Shutter Speed: 1-20 seconds (trying to minimize star blur). The 1 second shutter was only used when the aurora got really energetic and was blowing out my sensor leaving super overexposed spots. Most of the time I was around 5 seconds. F-stop: I have a prime lens, so I was at f/1.4 for the most part. Again, when the aurora got very active and brighter, I had the ability to stop down in lieu of changing the shutter speed or if I needed to to get more foreground in focus. For the most part, I didn't do that though. 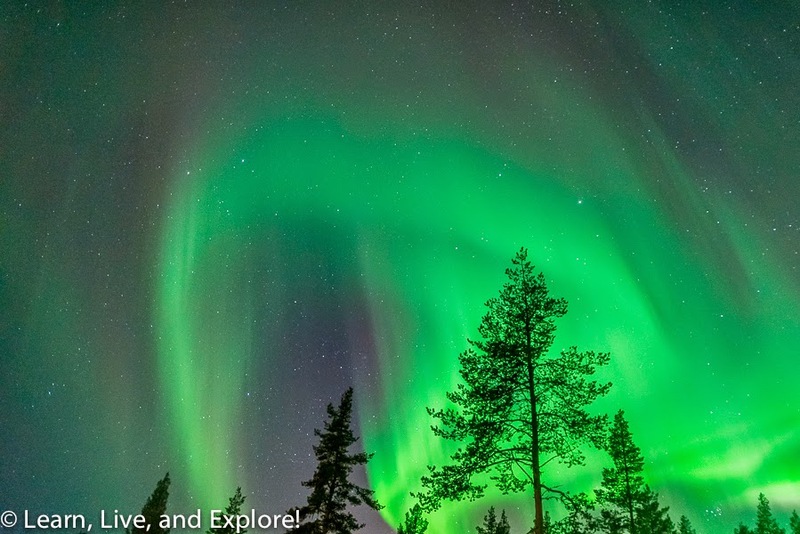 The exact science behind the aurora borealis and the various colors of green, purple, and red are definitely outside my circle of competence. 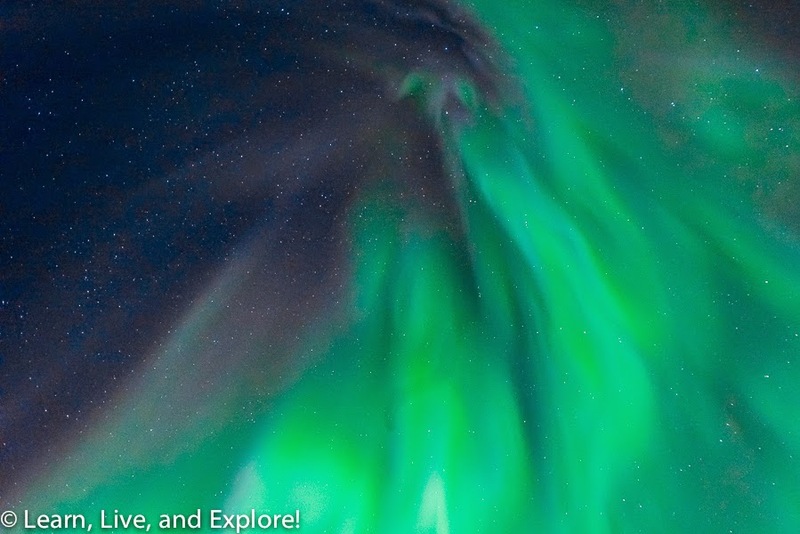 The NASA website gives this simple explanation: "The vivid green and purple auroral colors are caused by high atmospheric oxygen and hydrogen reacting to a burst of incoming electrons. 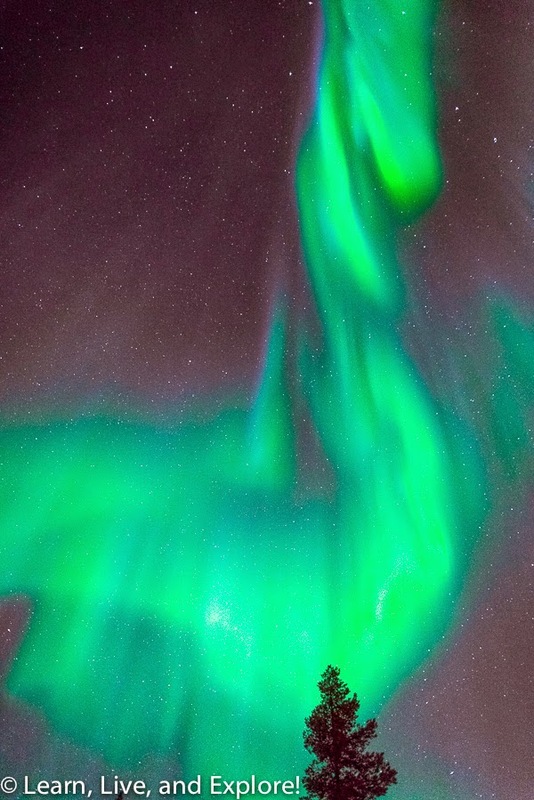 Many photogenic auroras have been triggered from a solar wind stream that recently passed the earth." 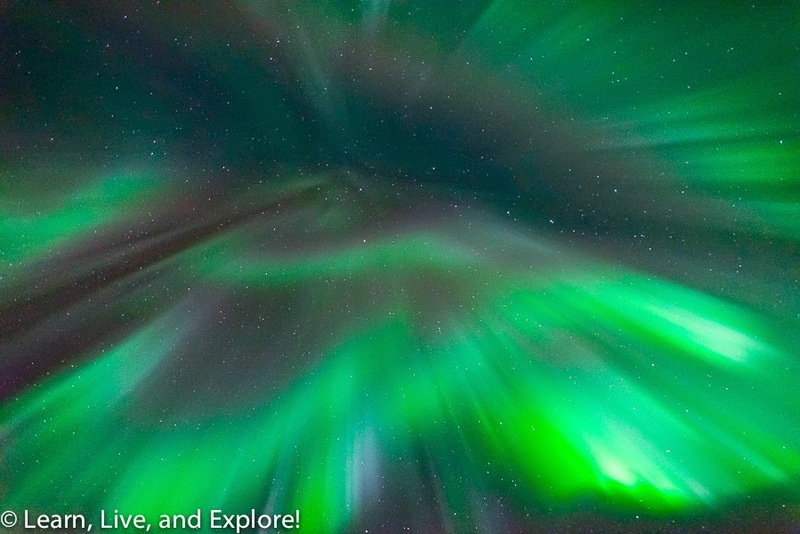 When looking for big light shows, solar events are key to generating the flares and wind needed to bring the energy to the earth and have it react with our magnetic sphere. The spectrum of colors you experience is dependent on the height at which the collision of the electron particles and gases take place, and the concentrations of gases at that height. The green is a lower height oxygen collision. 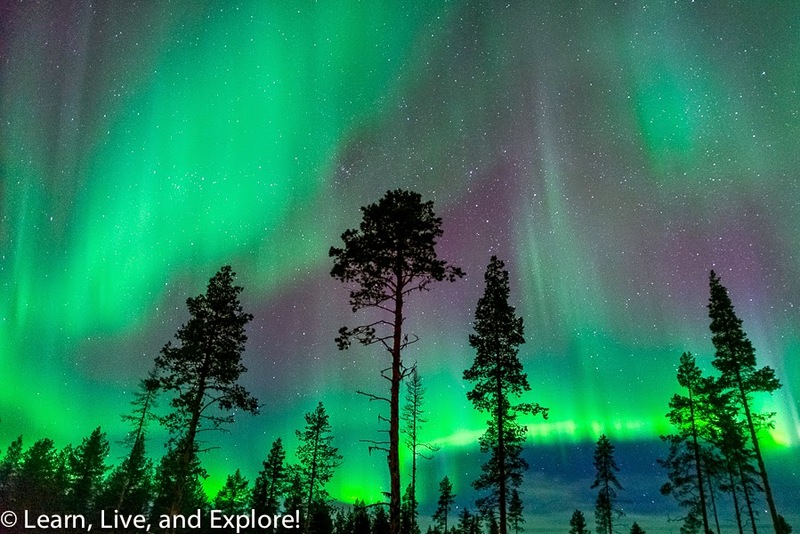 Hydrogen and helium higher in the ionosphere are what create the blues and purples. 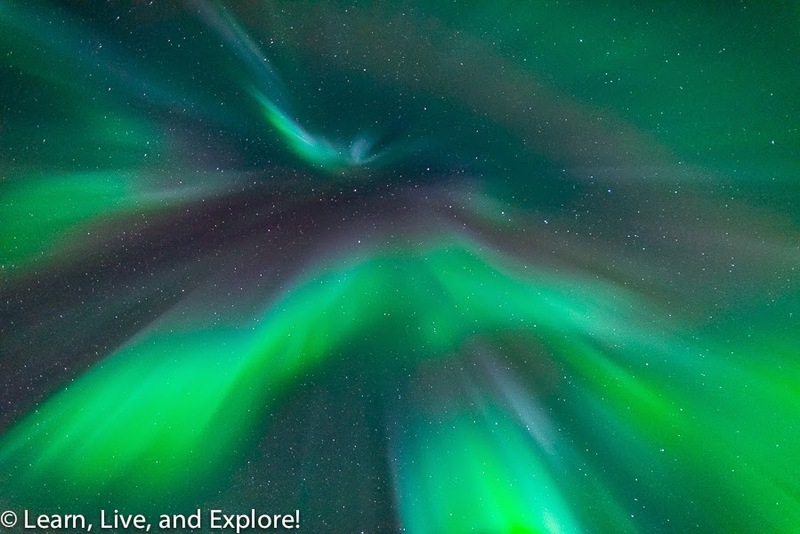 Sometimes there is a hint of red below the green curtains of light, which is caused by a collision with nitrogen. And that is where my brain stops comprehending! 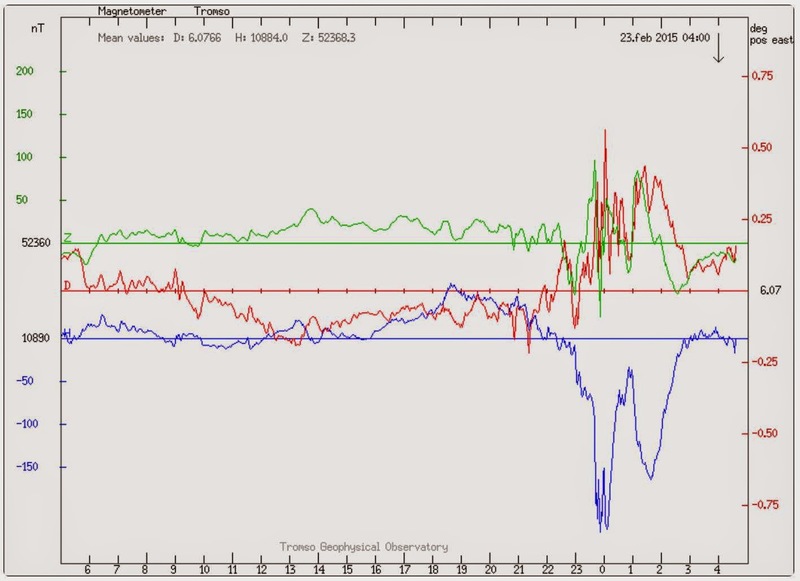 As you can see from the magnetometer reading from that night, the lights were not flaring up much until about 11pm, after which they made a huge spike movement that culminated in a phenomenal sight: a corona. 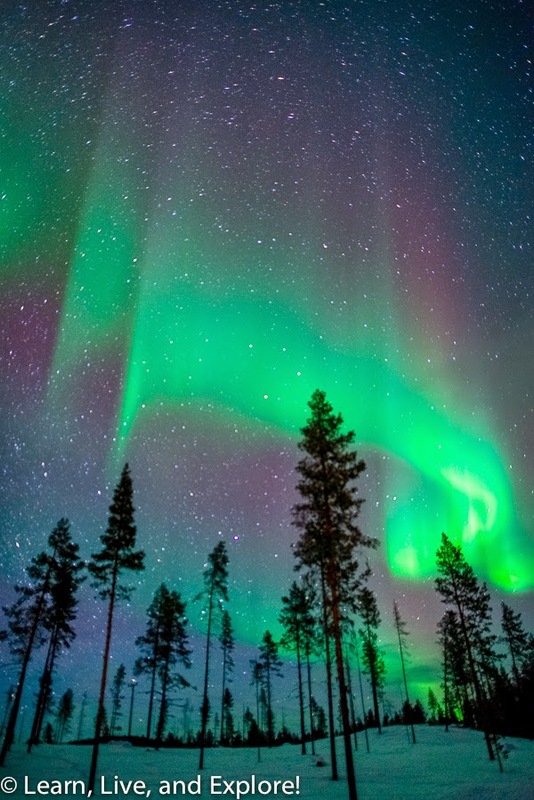 While normally the lights display themselves as curtains of light near the horizon, when the energy gets strong, they start to dance and move more rapidly and the "legs" of the lights elongate. 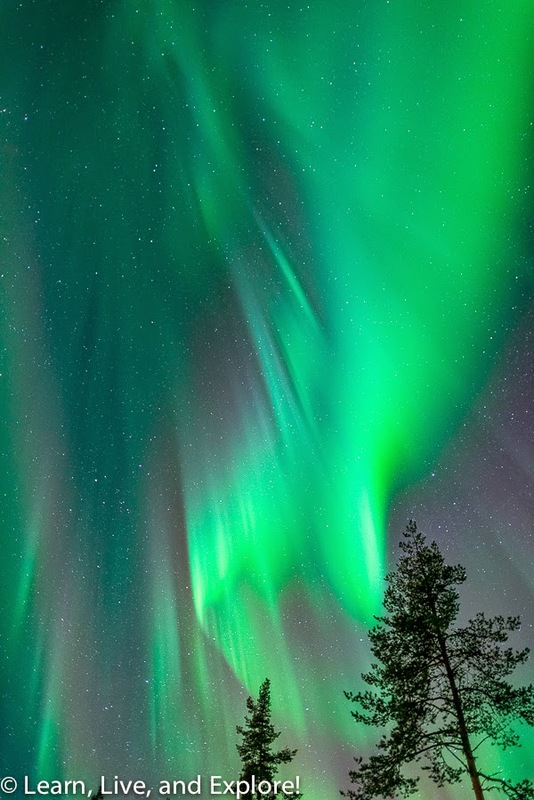 A corona is formed when the lights extend such that if you look straight above you, it seems as if the rays are converging to one single point. 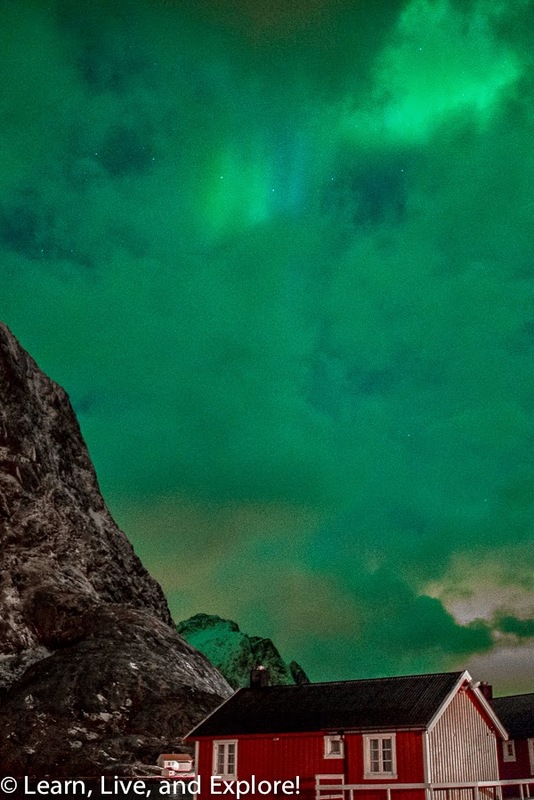 The fun part of developing all the photos from Norway and Sweden was finding interesting shapes and objects coincidentally formed by the aurora borealis. Here's one that looks like the Loch Ness Monster and one that looks like an abstract of my dog's face taken from a chin point of view (look for the nose/nostrils). UPDATE: I taught myself how to make timelapse videos in Lightroom with a series of my photos. They turned out great, considering I hadn't planned on doing this when I shot the photos originally! What do you think? Wow, Julie Girl! That last night must have been so satisfying after the long wait. A corona. Patterns and colors. I even like the first few you got In Finland where the clouds hung around. Happy you made the trip. Good shooting! Thank you so much! Yes, even with the clouds it is an outstanding experience!